CLEVELAND – This Thanksgiving is extra special for a Lorain County family who nearly lost their son in a freak accident two months ago. Jeremy Mohr was a senior at Grace College near the Fort Wayne, Indiana. The 21-year-old Lorain County native wanted to be an athletic director after graduation. It was a night in September when those plans were put on hold. “I was walking with a girl. I sat down on a hammock and when I sat down, the tree uprooted and hit me in the head and landed on her,” Mohr said. Eighteen-year-old Mallori Kastner was killed. Mohr was rushed to an Indiana hospital, and then to MetroHealth Medical Center. 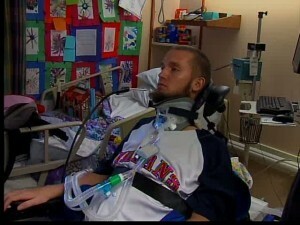 He was paralyzed from the neck down, couldn’t breathe on his own and couldn’t communicate. But in the two months since then, he has made remarkable progress. “He has feeling in his chest, upper arm and a little feeling in his back,” said Jeremy’s mother, Marcia Mohr. “The heart, drive, motivation can make a difference,” Jeremy’s doctor, Dr. Greg Nemunaitis, said.